Yesterday I had the joy of announcing TDR's first event, a petting zoo that I am co-hosting with O'Reilly, a technical publisher, at their digital publishing conference. This morning I got an email that promised to make the event 10 times more interesting than before. The image at right shows the work of Nick Chen. 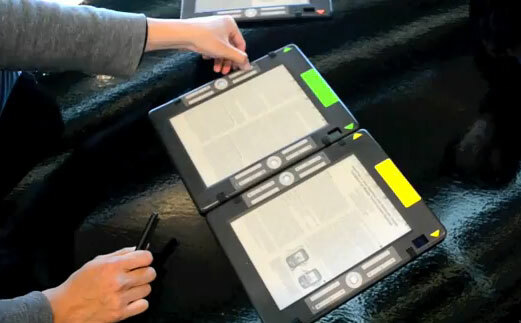 That's not a dual screen ereader; it's a pair of single screen devices that are designed to work cooperatively over a wireless connection. And yes, he can network 3 or more devices together. I last covered Nick back in May, and his gadgets are worth seeing even more now. And that's why I'm happy to say that he has greed to bring them to the petting zoo.